Doctor Jones, Doctor Jones, wake up now. Indiana Jones and the Infernal Machine is now available to buy digitally for the first time since it was released back in 1999. The classic 3D action-adventure originally launched on October 31st of that year. It was developed by LucasArts with the project headed by Hal Barwood, who previously directed the most treasured of Indy’s virtual adventures, Indiana Jones and the Fate of Atlantis. The Infernal Machine was the first Indiana Jones game to adopt the Tomb Raider structure (a weird cycle given Tomb Raider’s own debt to Indy). It featured full 3D environments and visuals that were decent at the time, and offered plentiful environmental puzzle solving alongside a sprinkling of (frankly rubbish) combat. I actually owned the Infernal Machine when it first released, although I don’t think I got very far in it. Mostly I recall that Indy’s voice sounded a bit weird, because LucasArts (understandably) couldn’t get Harrison Ford to do the lines. 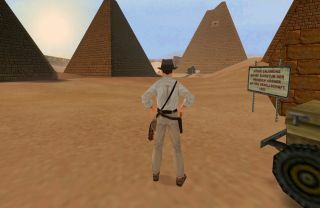 The game takes place in 1947, which is well after the adventures in the films, which goes some way to explaining the extra gravel in Doctor Jones’ vocal chords. Whether you’d actually want to play a '90s 3D adventure today is another question entirely. But it has been a very long time since the PC had a proper Indiana Jones adventure. The last one was Indiana Jones and the Emperor’s Tomb, which Andy Kelly was pleasantly surprised by when he returned to it last year. More recently, the closest the PC has come is Lego Indiana Jones and its sequel. There’s Tomb Raider, of course, but Lara’s new, grimdark direction doesn’t exactly scratch the same itch. Anyway, if you’re hankering after a bit of archeological action, you can now pick up Indiana Jones and the Infernal Machine on GOG for £4.69/$6.10. Here's the original trailer, which I will warn you has Not Aged Well.